How does the enquiry to booking process work for venues? Enquiries, bookings, event confirmation – let's start at the beginning. You've listed on Venuemob, you've added amazing content, you're flying up those search results, and now it's time to book events. You'll receive an enquiry email notification. The email will contain the event details, and the customer name, and any message they included in their enquiry. Click 'Respond now' and you'll head to Venuemob Manager messaging system without having to log in. It's vital that you respond quickly. Customers will send enquiries to at least three or four venues per event they plan, so the quicker you respond, the more likely the customer will be to book your venue. And the higher you'll be ranked! Respond via the messaging system in Venuemob Manager, or by replying directly to the notification email. You'll also receive the customer's phone number, and we recommend following up via phone. For the security of customers, we do not provide their email address. Do NOT supply your direct email address to customers. It means we can't provide venues with accurate stats, and it means your customer will be replying to you off the platform and to others via Venuemob Manager (which is inconvenient for them). Once you've chatted with the customer about their event requirements, lock in the booking! Use your own process, in whatever way works best for you. Send them your own contract via Venuemob Manager, and take the deposit amount using your own process. On the Venuemob end? Just switch the enquiry status to 'Booked' via Venuemob Manager. Ensure that you do this promptly in order to avoid pesky confirmation reminders. Step five: Host the event! 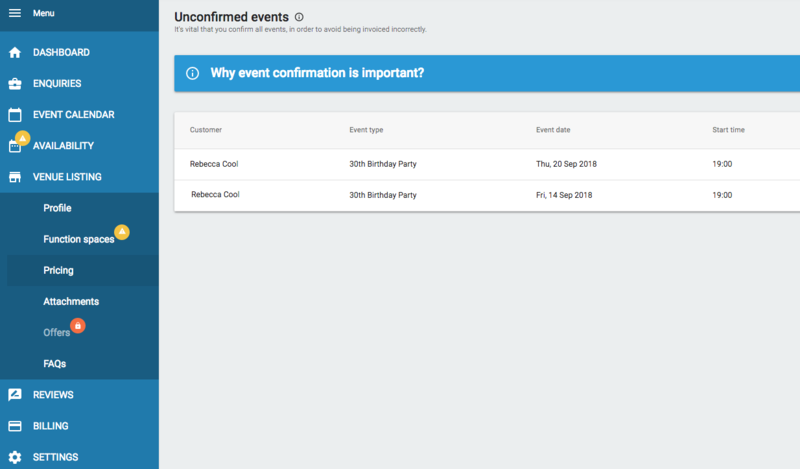 After the event date has passed, you will receive an email from the Venuemob team, and the event will appear in the 'Unconfirmed events' section of Venuemob Manager. Click on the link in your email to be taken straight into the 'Unconfirmed events' section of Venuemob Manager. 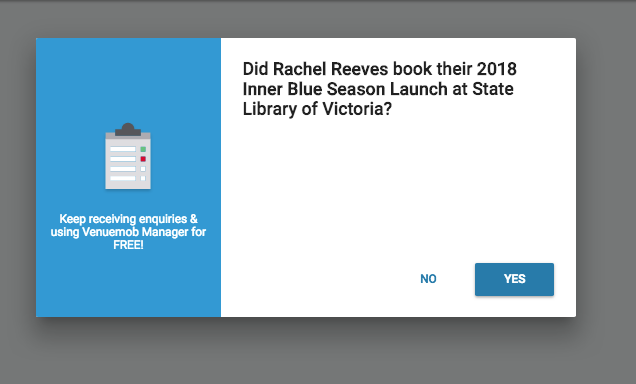 A pop-up will appear on your screen. Click 'YES' or 'NO' to indicate the status of the event. We'll check in with you, and the customer after the event date to confirm the total spend of the event. After that, you'll receive an invoice from our team!